Currently viewing the tag: "cutter"
If you’ve done any outdoor electrical work around the house, you’ve probably run into BX cable at some point. Cutting the casing without marring the conductors can be a problem; I tried with a hacksaw once, and all I got was a partially-sliced housing and a scarred thumb. About $30 could have saved me some trouble. 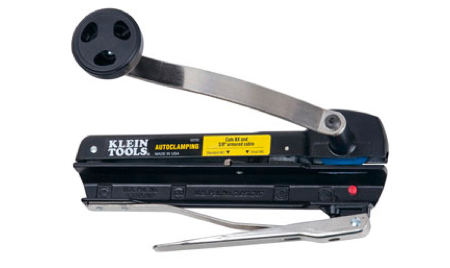 Klein’s BX cable cutter slices the housing only, avoiding damage to the internal wires thanks to a cutting wheel much like you’d find in a tubing cutter. Clamp the cable in the tool’s jaws, give the crank a few twists, and voila. Ixnay on the ousinghay, and no blood on your shirt, either.